This painting was done in Lyon, France in March of 2012. It is a declaration of what God is doing over France at this time…..drawing anyone but particularly the arts and the artists to Himself. I believe France has a leading role to play in the beautification of the Bride of Christ. The human heart and soul was made to feel and know the tender fragrant beauty of God’s love, to be very much like a garden where God enjoys walking and talking with us much like the Garden of Eden is described. 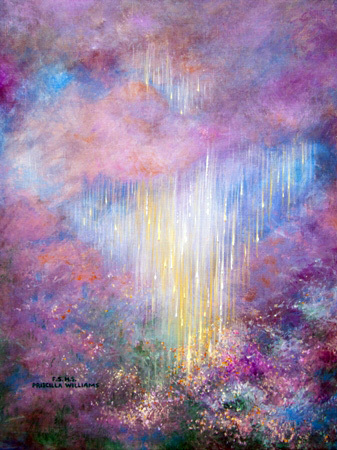 In this painting, God is pouring out of His heart the rain that makes the garden of the soul ever so beautiful. The garden of our innermost being cannot be beautiful as was intended without God’s heart pouring into it. Rain and light are streaming down to raise up the potential beauty of the human soul-garden. A garden draws us and begs us to linger longer, relax, fill the senses and enjoy just BEING. Do you feel the draw through the painting? May you realize within the garden so beautiful and fragrant where you and God delight together.